What are the core elements of a website that you should focus on? 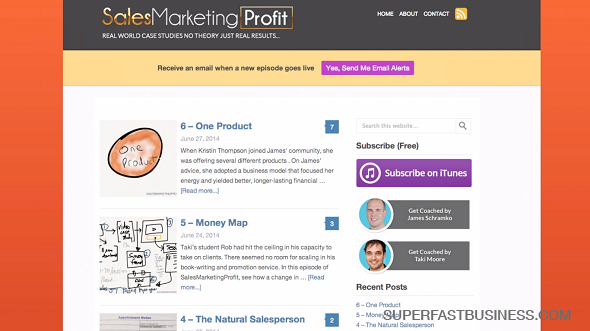 This episode looks under the hood of the Sales Marketing Profit site to reveal the essentials of an effective website. The core elements of a website. [Click To Tweet]. What’s your website all about? [Click To Tweet]. Bring out your customer’s curiosity. [Click To Tweet]. All right. Websites. So one of the questions I had was “What is the 4%?” You know, if you could only do certain things, what would you focus on? What are the most important elements to look for on your website? And I’m going to just step you through one of my recent websites, by way of a case study, which is my preferred technique, and I’m going to show you what to focus on. So the most recent website we built was a podcast website, surprisingly. Because apart from the things I sell, I have this promotional chain of websites, mainly podcasts. I have ThinkActGet, FreedomOcean, KickingBack and SalesMarketingProfit. Now Sales Marketing Profit is the most recent website we built, so I think it’s a great example of the core elements you need. This really got up and running super fast. It was easy to put together another podcast because I’d already done several others, so if you’re looking for the main elements that go into it, I’ll show you what they are. The first thing is to come up with a name and to have a prominent logo, and a catchphrase. So the domain that I had was SalesMarketingProfit, it seemed to explain what we’re talking about quite well, and then we have a sub-headline: Real World Case Studies – No Theory, Just Real Results. So we could actually change that now to “Real World Case Studies – All Killer, No Filler” could be the newer version of that based on where the show’s gone. However the show has really reflected this premise. So coming up with a logo and sub-headline helps you set the whole website for you and for your customer base. It’s clear to a new visitor what is this thing all about. The next element that you want is an email capture. So we have, on our podcast, we have the ability for people to subscribe to get email alerts, and I think we have around a thousand subscribers already, so people are clicking on this. You can also use welcome gates, and you can use Dreamgrow scroll triggers. If you don’t know what that is, just look that up on my SuperFastBusiness website in the Search box, Dreamgrow scroll trigger box. It’s that little flying yellow thing that pops up. We get a lot of opt-ins from that. Apart from having a nice logo and sub-headline, you really want to capture email addresses. That’s an absolute super priority, and one that I left way too late. And by the way, you’ll notice I don’t have a fill in your email field. People just click on it, and it’s a Leadbox. Leadboxes are very effective because they are easy for people to fill in their details, they can be put anywhere on the page, and they work. What core elements does SalesMarketingProfit have? Then you have really good content. And I suggest the standard operating procedure for any of your websites is have images on every post. Every single post on our website has an image, because you can use the image as a preview on the homepage, and I’ve found by having images on the homepage it halved the bounce rate. That’s right, 50% by having an image. People will click through because of an image. And also, importantly, when people share the image on Facebook or Pinterest, or Google+, it’s going to pull the image into the snippet, and it’s going to get you much more click-through to your website. Also, it allows you to engage people on a more emotional level. It brings out the curiosity. It reinforces whatever your topic is. So we have some interesting pictures. All of my podcasts and all of my blogs, I don’t think you’ll find any without a picture of some kind because it’s the standard operating procedure. Also, if you can have the little bubble that shows how many comments, that’s a nice way to bring in social engagement, and I do recommend you date your posts and have a codec for naming. We quite often with podcasts have like 1, 2, 3, 4, 5, 6, we number the episodes, and we have simple descriptions. Sometimes the description is, obviously in this case, it’s very, very to the point, but it requires a little bit of explaining and that’s why people might click in to find out more about it. There’s some element of curiosity but it’s very factual and it’s easy for people to find later when they’re looking for it. If you were listening to this training, and then you wanted to go and find the episode, it would be really easy to find. You could even google “one product sales marketing profit” and over time that will get a really good search result. And the next element is the call-to-action. We want people to subscribe on iTunes so that every time we upload an episode it pushes to their smart device. That’s very, very important. I would say for some of my podcasts if I don’t email my podcasts, if I do no socializing of it, I’ll still get 1,500 people get my episode on their device and listen to it without any other promotion. So you need people to subscribe, not just via email, but via iTunes. And then of course the whole point of your publishing content is that you’d like someone to do something. In this case, this whole podcast is about having people come to me and to come to Taki for coaching. Well, the long, in-depth personalized version is to come and get coaching and do it for yourself. You give out the taster plate, and let people come to you for more. No one could say we aren’t delivering amazing value on these shows, but of course the getting involved with the community, and getting direct help one-on-one is the next level, and that’s easy for people to find on our site. It’s in that sidebar on every page. So these are the 4% elements. That is a brand name and a sub-headline that clearly describe what you’re doing, an email capture, an image, well-described posts with some social proof, and then a call-to-action element. Those things are what I would focus on before you get too involved with just about anything else. Great stuff James! Thanks for posting. Putting my website together for my youth speaking business as we speak/type, and this post was very timely. Also…huge fan of TAG. Thanks for all you do! Well done Sergio – you are on track! Nice one James! So you definitely recommend having a separate blog for the podcast rather than having it as a heading on your Super Fast Business site (under the one product umbrella)? I dont recall mentioning that? I have separate podcast sites where I have a co-host partnership. For most people it will generally be better / easier to just have one podcast / blog like SuperfastBusiness.